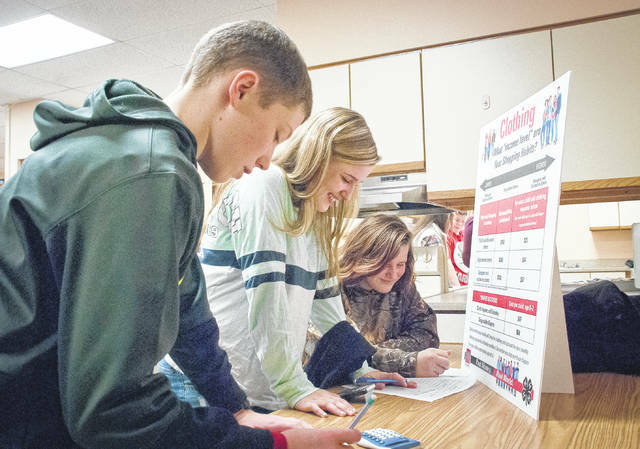 Buckeye Valley Middle School seventh-grade students participated in a real money/real-world simulation Wednesday that allowed them to have a hands-on experience with the rewards and consequences of making financial decisions. With a monthly salary for an occupation of their choice, they made spending decisions to meet the needs of their simulated family and lifestyles. Looking at the poster that displayed the cost of clothing choices, from left, Sam Jones, Kayleigh Cain, and Delilah Honeter try to manage their wants and needs against their incomes. “I’m happy I don’t have kids,” said Honeter, because she was running short on money. “It’s expensive,” said Cain.